The #100hardtruths was shared with me by my friend, the teacher, scholar, advisor and activist, Gabrielle Foreman. “The press looms large in the stories U.S. Americans tell ourselves. Freedom of the Press is enshrined in our forward-thinking constitution; it’s central to our democratic values; its existence marks the distinction between us and the forms of government our long-lived republic outshine. The founding fathers got it right—and are rolling in their graves. If only they could appear at Mar-a-Lago en masse to share these principles with the man who also spends time in the White House. Yet, from its inception advertising’s betrothal to the press has produced—or exposed—monstrosities of various stripes, the star, perhaps, being slavery’s horrors. Ben Franklin’s Pennsylvania Gazette placed advertisements for Black captives, those for sale and those who tried to liberate themselves, despite enslavers’ claim to the free labor and freedom of expression and assembly whites prized for themselves. I’m hardly the first scholar to make this point. David Waldstreicher’s biography about Ben Franklin, race, and slavery brings to life the complexities of the man we revere as one of the nation’s earliest abolitionists. While those in the US like to celebrate the press, the truth is that early newspapers all over the country—not only in the South—raised significant revenue by running runaway ads and for sale notices that appeared decade after decade for literally hundreds of years. 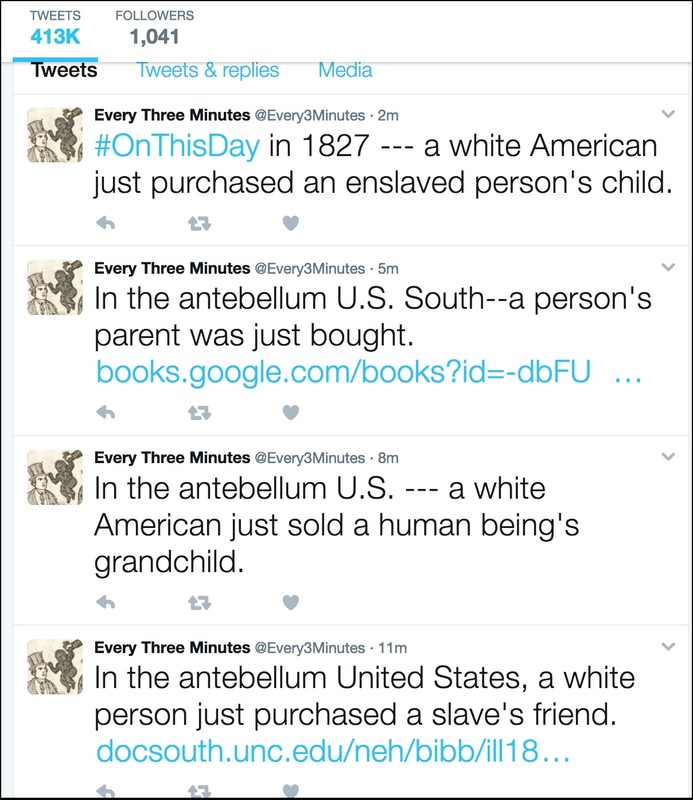 The dizzying, numbing, number of Black people separated from their friends and families in the internal slave trade is now documented in the project @EveryThreeMinutes which tweets a timed reminder that between 1820 and 1860 someone was sold in the US with a frequency, a ubiquity, that was once part of the everyday press. 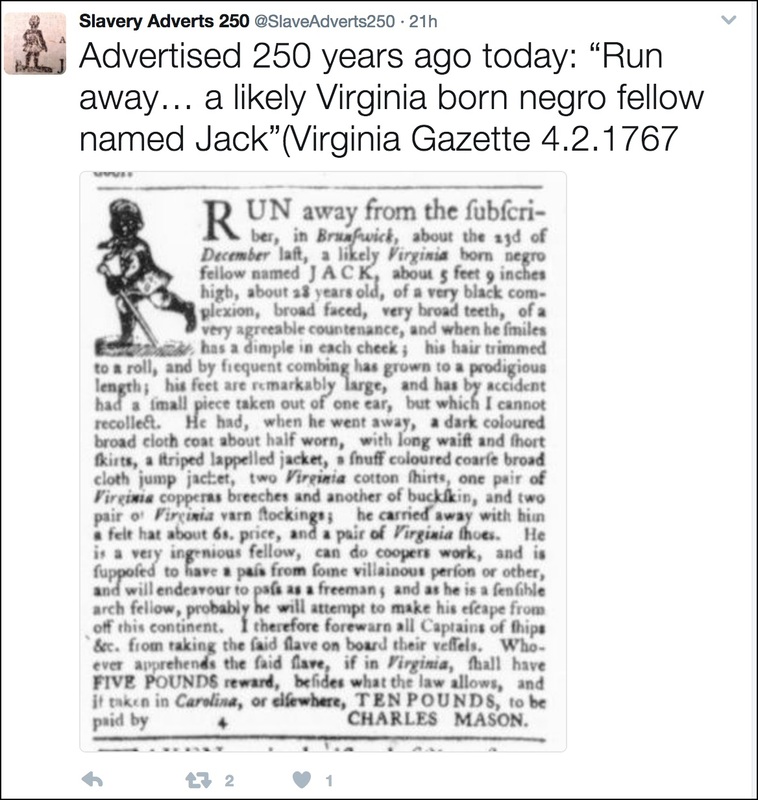 @SlaveAdverts250 features daily a slave advertisement that originally appeared in Colonial America, 250 years ago to the day. Researchers turn to newspapers—as well as to broadsides, financial records, letters and personal papers—because they hold the most complete record of the collective story of Black sales. Newspapers likewise capture Black flights to freedom—and whites’ mostly successful attempts to retain and contain what they characterized as a loss of revenue, capital and property. Nineteenth-century Black papers tell a different story about the relationship between the press and advertisement. From before the Civil War through the 1890s—for half a century or so, once enslaved people whose families were strewn and separated by the multiple bombs slavery set off in their lives—people placed their own heart-rending ads that spread the word of their search for lost kin. Last Seen: Finding Family After Slavery, a collaboration between historic Mother Bethel AME Church and Villanova, shows how parents and siblings, husbands and children, spent decades looking for loved ones they had last seen years before. As incredibly valuable as papers such as the long-running Black paper, the Christian Recorder or the postbellum Colored Tennessean, have been to Black literature, politics and expression, the link between slavery, the press and advertising sales continued well after the Civil War. These haunting remembrances express a love for and commitment to family that should counter the nonsense about lack of commitment to family structures that have been hoisted onto Black Americans as we have fought to keep our families together against relentless odds. Newspapers (and president’s attention) to Black families’ supposed deficiencies are belied by recent studies (National Center for Health Statistics, 2013) on the quality and quantity of time that Black fathers spend with their children now and by the sheer pathos, commitment expressed and revenue expended by “information wanted” ads.